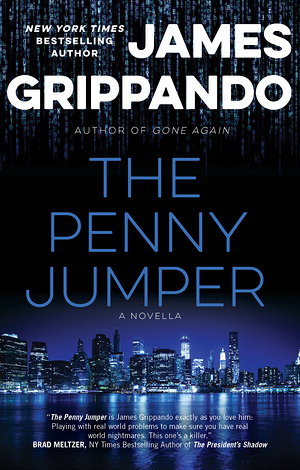 New York Times bestselling author James Grippando ventures into the world of astrophysics, high-stakes trading and the algorithms that up the game with THE PENNY JUMPER, a thriller about a young scientist lured to Wall Street by the promise of a pay-day that will offset her student loans and jump start her life. Things haven’t come easy for brilliant young astrophysicist Ainsley Grace. Her mother, an equally talented astrophysicist, died when Ainsley was just a child. A “brainiac” who started college at age sixteen and earned her Ph.D. before most people her age had even settled on a major, Ainsley struggled to fit in. But the pieces of her life seem to fall together when Ainsley teams up with her mother’s former colleague at MIT to finish Project Cosmic Company, which her mother had been working on when she died. A short-term opportunity to pay off her mountain of college debt by writing stock-trading codes for a high-frequency trading firm on Wall Street turns into a nightmare. Her job is to make sure that her firm’s supercomputers are faster than any others on Wall Street. Because she is able to draw on the same algorithms she’s been writing for Project Cosmic Company, it’s a snap. And because astrophysicists are Wall Street’s new whiz kids, it pays well. But there is a hidden price that comes with Ainsley’s work. The world of high-frequency trading is “survival of the quickest,” and the difference between making a billion and losing a billion dollars could be less than a nanosecond. With stakes this high, Ainsley finds herself caught in the middle of a secret and deadly battle for speed. With THE PENNY JUMPER, Jim Grippando brings us into a high tech, high risk world where only the most cunning come out on top – until they confront the amazing Ainsley Grace.